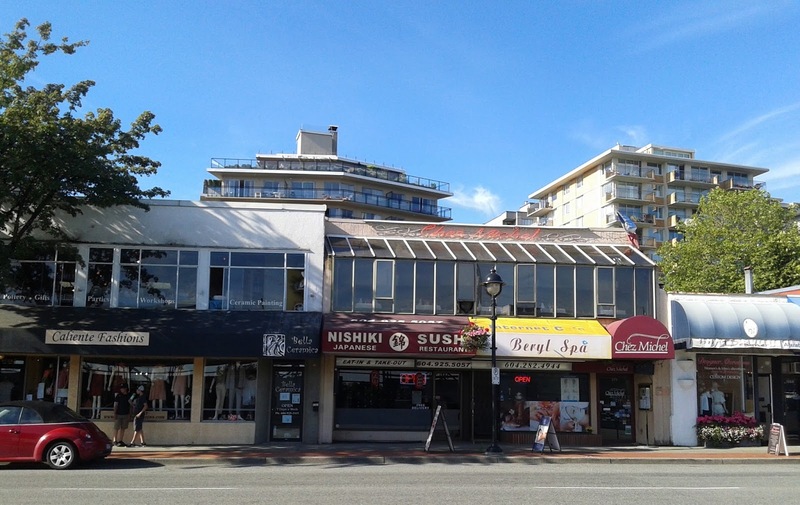 On a gorgeous, sunny day, I could not think of anything better to do than to embark on a traffic jam adventure to Ambleside in West Vancouver for some sushi. My original plan was to go to Sakura Ichiban for some decent, reasonably priced eats, but since it was closed, I waddled around to find another sushi restaurant. 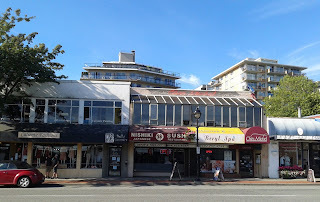 I passed by Nishiki Sushi next, and since there were people inside, I went to go check it out myself. Nishiki Sushi is Chinese-operated and features a clean, elegant dining space and a quiet ambience. There weren't that many dine-in customers, but they did have a steady stream of take-out customers. The two chefs were overwhelmed with all the orders, and I heard the words "it's almost ready" about as often as I heard the entrance door open. As you can imagine, the food came quite slowly. Since the bento boxes were a significantly better deal compared to ordering à la carte, I went for the Bento Box D, which came with a Miso Soup. 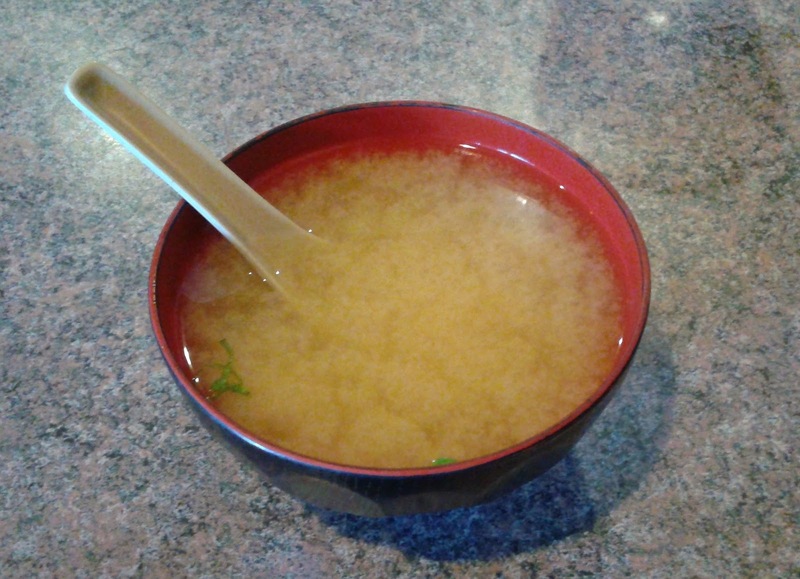 The Miso Soup was perhaps the most underwhelming item of my dinner because it had a rather thin consistency and tasted quite watery. 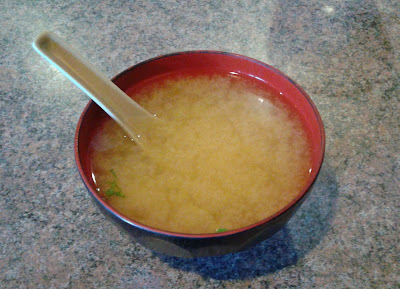 It came with green onion and tofu, but it did not have a very rich miso flavour. 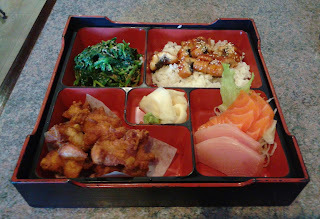 Here is the rest of the Bento Box D. The price tag on this box was $14.95, which I found slightly expensive considering the amount of food given. The Goma-ae was made with tender baby spinach, which made it nice and easy to digest. The sesame sauce was spread evenly for a more well-rounded sweet flavour, though I would have liked to see slightly more of the sauce. 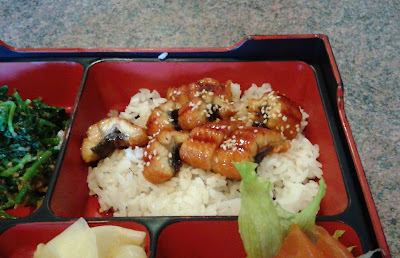 The Unagi Donburi tasted remarkably similar to T&T's pre-cooked Unagi Kabayaki packages, and it came with juicy, fatty pieces of eel. I don't have a problem with T&T's Unagi Kabayaki if it is prepared properly (my mom is an expert at making T&T's unagi taste heavenly). The unagi here was prepared well, and the steamed rice was amply dressed with sauce. This was listed as "Chicken Wings" on the menu. Now, if these are indeed chicken wings, then I have been lied to my entire life. The chicken here was tender and came with sufficient moisture. The deep-fried exterior layer was not hard, but a little simplistic flavour-wise. 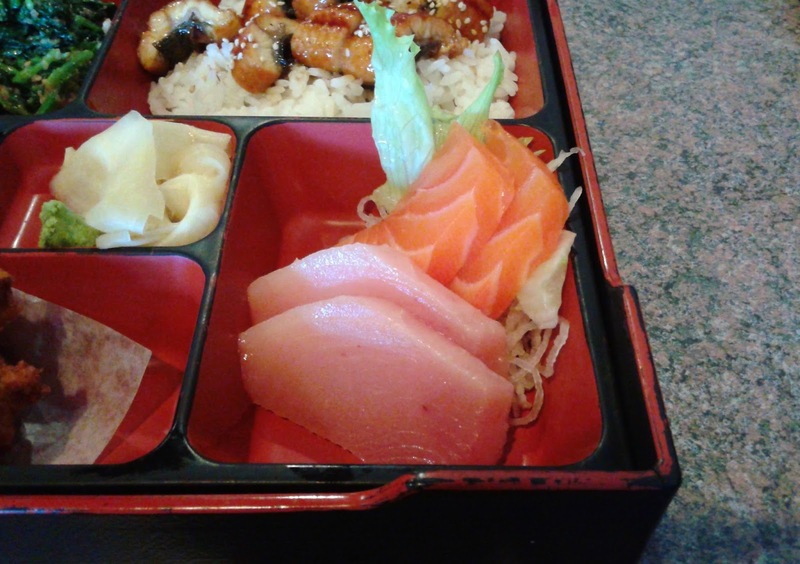 The Salmon Sashimi came with a smooth texture and was cut neatly, though it was not especially flavourful. The Tuna Sashimi had a soft, smooth texture. One piece was nice and fatty, while the other tasted slightly fishy. 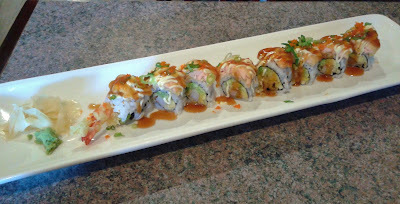 After the Bento Box D, I had the Stanley Roll, which consisted of a dynamite roll topped with "fired salmon." I literally have no idea what "fired salmon" means. Does it refer to a salmon that lost its job because it couldn't swim like the other salmon? In either case, I tried to make an educated guess and assumed it was seared salmon, but that was clearly not what came to my table. 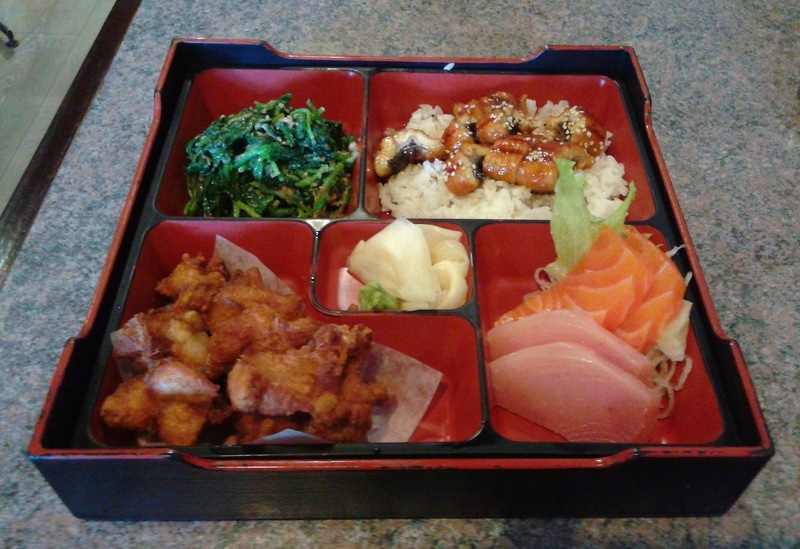 The salmon that lost its job was cooked and lightly coated with tempura batter. The tempura prawns inside were quite greasy, and the sauces were quite thick. The mayonnaise was rather strongly projected. On the plus side, the prawns were plump and juicy, and the sweet avocado helped bring the flavours together. The waitress had a friendly attitude, but she was obviously overwhelmed by the volume of orders. Attentiveness understandably suffered as a result. 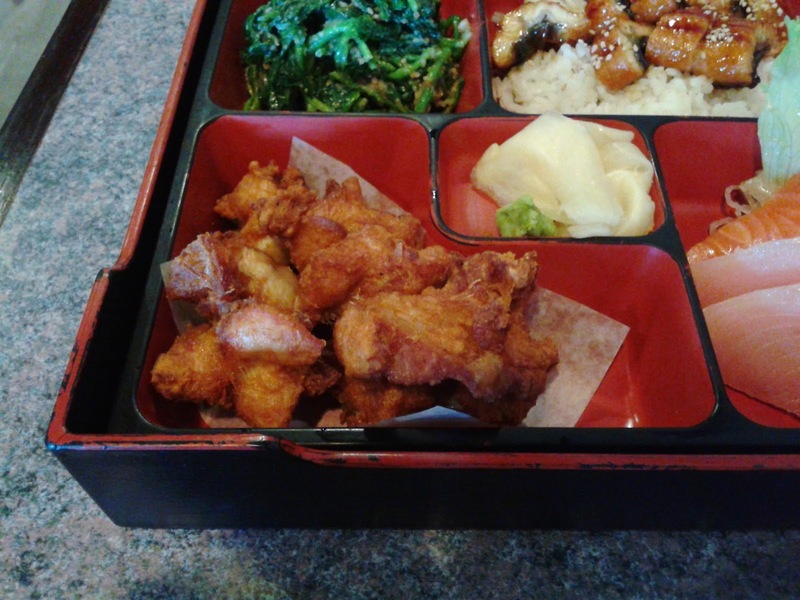 The food was decent and generally consistent, although not especially outstanding. It would be nice if they edited the menu to remove any inconsistencies or possible sources of confusion. 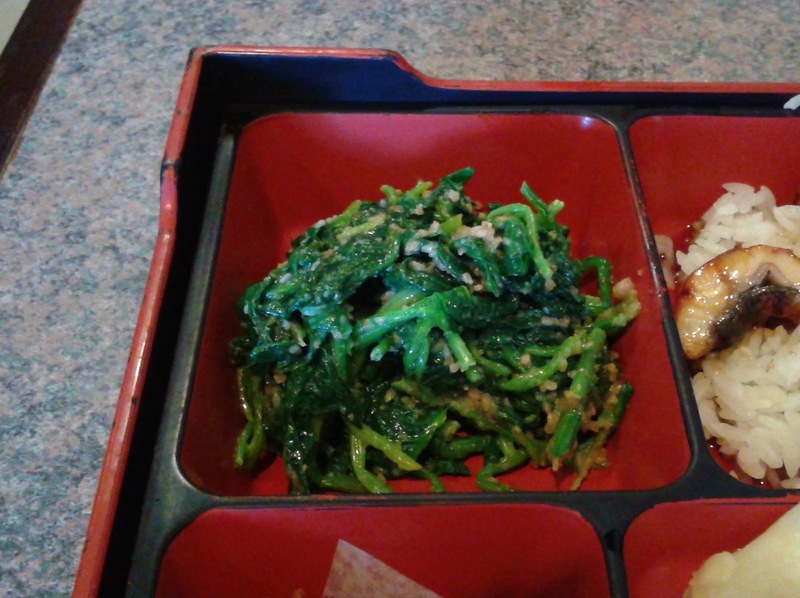 All in all, Nishiki Sushi appears to be an average Japanese restaurant that may be a convenient choice when nearby Sakura Ichiban is closed.